Marc van Iersel and Erico Mattos discuss ongoing supplemental lighting research. Picture by Dorothy Kozlowski, University of Georgia. Candidus Inc., a company co-founded by Drs. Marc van Iersel and Erico Mattos was featured in UGA’s columns newspaper and on-line. The story discusses the role of UGA’s Innovation Gateway in helping to get Candidus, Inc. off the ground. Innovation Gateway focuses on transferring technologies developed at UGA into the marketplace. 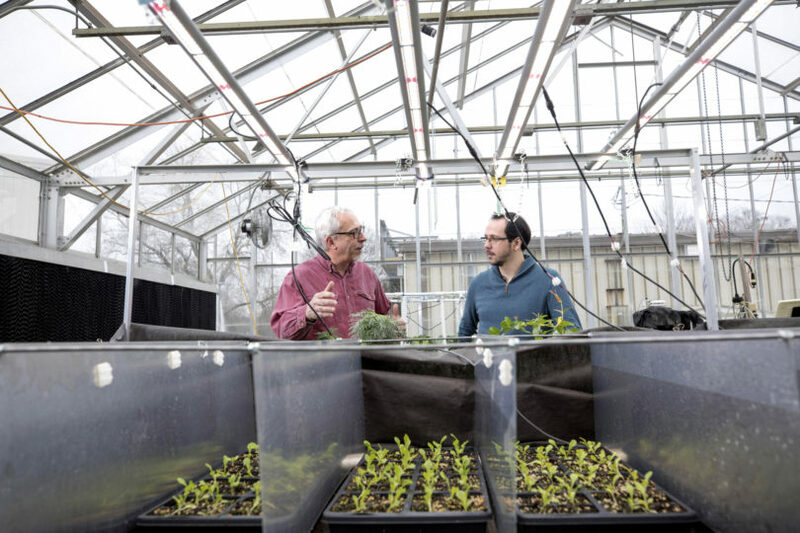 Candidus, Inc. was founded to commercialize ‘smart’ supplemental lighting control systems, developed in Dr. van Iersel’s Horticultural Physiology Laboratory. The research that led to the development of the technology and founding of Candidus, Inc. was funded by the Georgia Research Alliance, with help from Innovation Gateway.